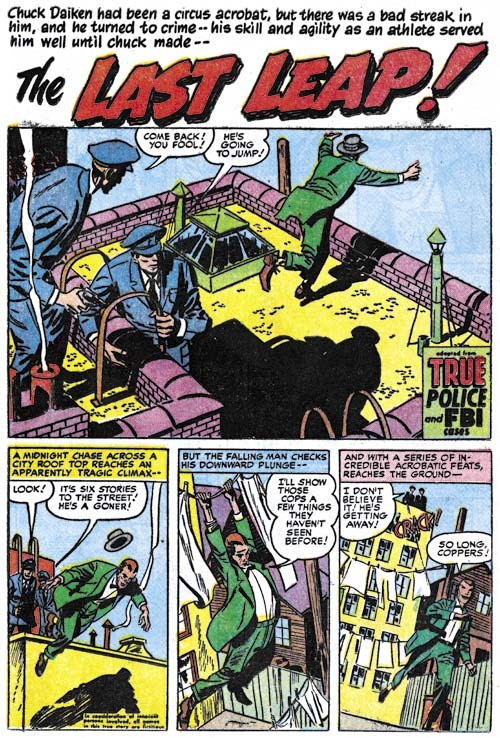 If I were writing this serial post based on the amount of material produced for the Prize crime comics, Ted Galindo would have had the third chapter ahead of Bill Draut. Although he worked on Prize crime comics for just a little over two years he was quite productive during that time. 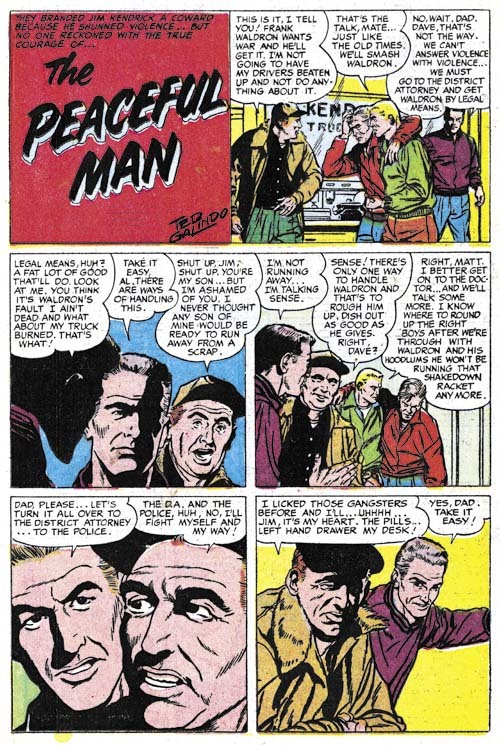 Some issues even had two stories drawn by this artist. 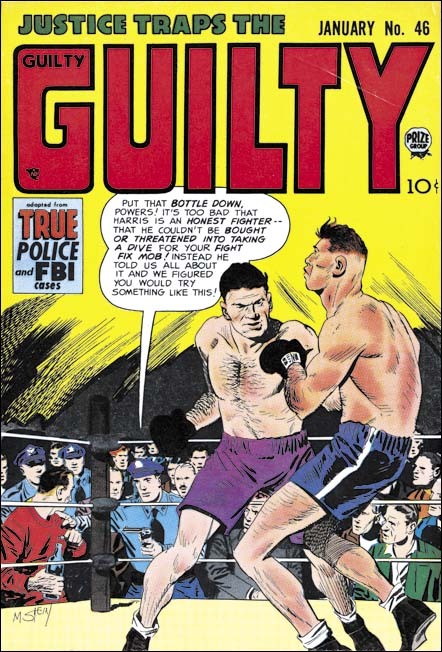 Most of Ted’s art appeared in Justice Traps the Guilty because the other Prize title, Headline, was cancelled only two issues after Galindo started to provide work. 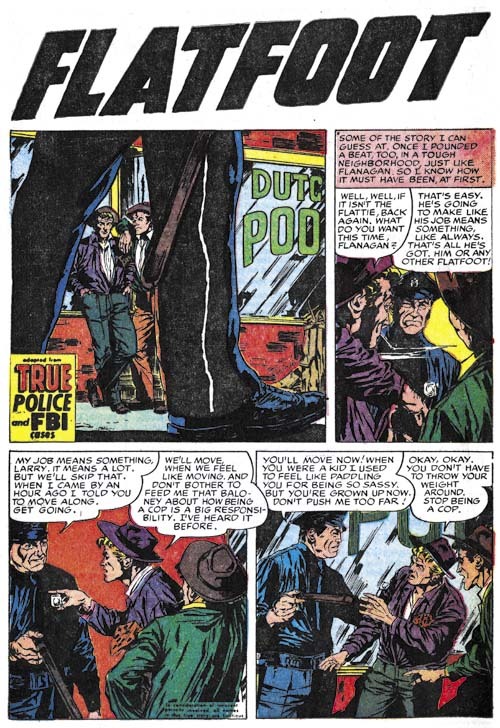 Galindo’s first piece for Prize Comics was “Flatfoot” from Justice Traps the Guilty #68 (November 1954). This was even before “It’s Mutual” that he did for Foxhole #4 (April 1955). The earliest listing for Ted in the GCD is February 1955 so it is possible that “Flatfoot” is Galindo’s earliest published comic book art (or not, the GCD is a work in progress and is not always accurate). In this early piece, Ted is already an accomplished artist but has not arrived at his more distinctive style. The most significant difference is the much heavier inking. His later work would have a minimum of spotting but blacks played an important part of the art in “Flatfoot”. Ted’s predilection for splashless stories is also suggested by the rather small splash provided in this story. Also already present is Galindo’s fondness for tall narrow panels. 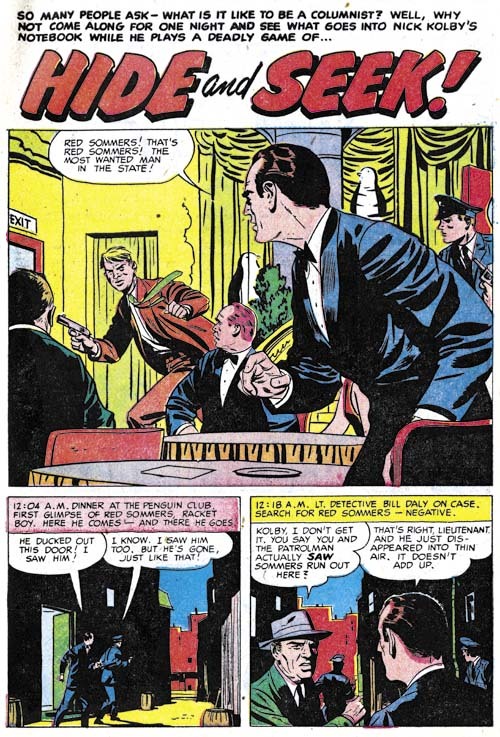 Galindo’s JTTG #68 work was not repeated and this artist would not reappear until “Flash Cameron Investigates a Disaster” for Headline #76 (May 1956). Judging from the GCD, Galindo had worked in the interim mostly for Charlton. With his reappearance in Prize Comics, Ted had fully arrived at his familiar style. Most of his stories would not include a splash panel but would instead start with a title panel no larger than the rest of the story panels. 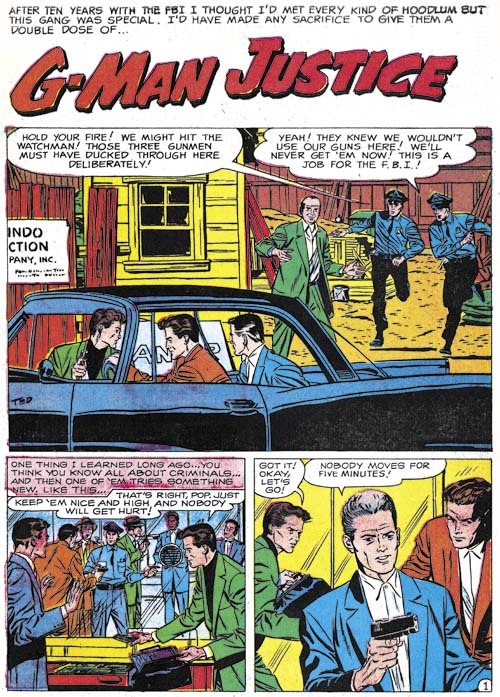 Since most artists in the Prize crime comics used half page splashes, Galindo’s format indicates that even though Prize artists were working from a script they still had leeway in the panel layouts. His inking would be light with minimum spotting. But when he used black it was usually in relatively large areas filled with ink. One of Galindo’s strengths was his adept characterizations. 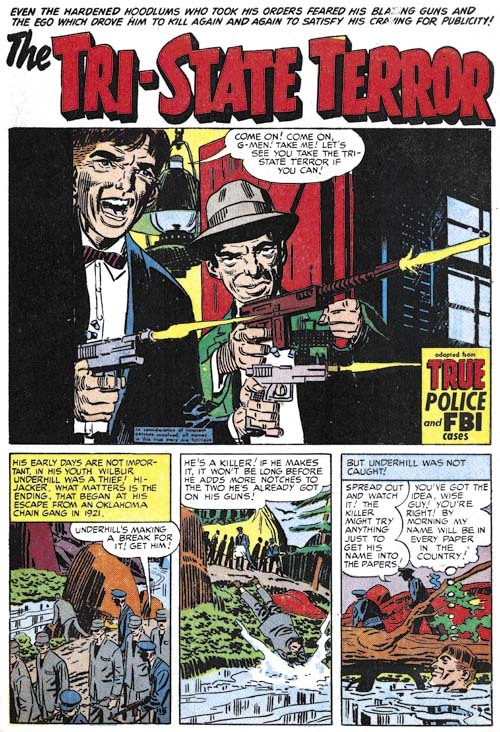 The post Comic Code Prize crime comics often included sequences of talking heads. with less talented hands these sequences could become rather boring, but Galindo’s carefully handling of the viewing angle and his effective emotional portrayals keep his stories interesting. On page 3 of “The Coffee Man” You can just feel the captain’s discomfort with a disagreeable duty. Even more importantly you can see Willie’s progression from a happy attitude to sadden realization that his life has been drastically offered. No blazing guns, but still a great piece of comic book art. While Galindo could handle emotional portrayal he was no slouch when it came to action. As the example from “Wall of Silence” shows, this was not Kirby action. 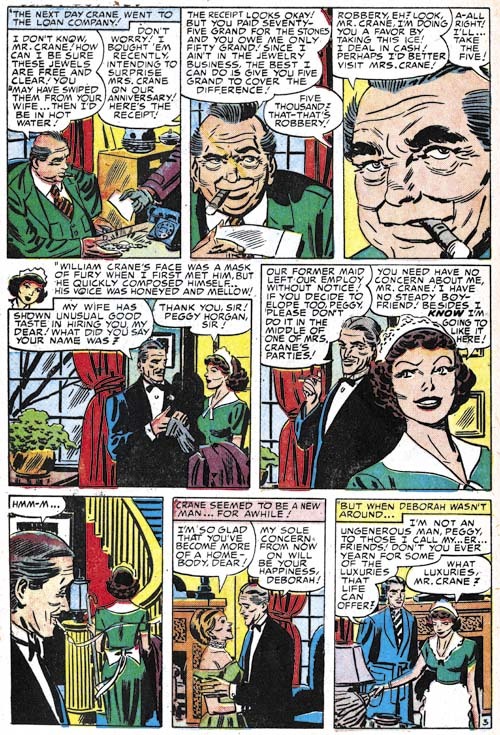 Frankly I am not sure where Galindo drew his inspiration, perhaps from Alex Raymond’s syndication strip Rip Kirby. Generally Galindo’s strengths lay in his careful handling of talking heads and action, but in “The Printed Word” he shows how well he could do suspense. And it is not just page 4, the whole story is filled with effective drama. Ted’s use of blacks plays a important roll in the telling of the story. 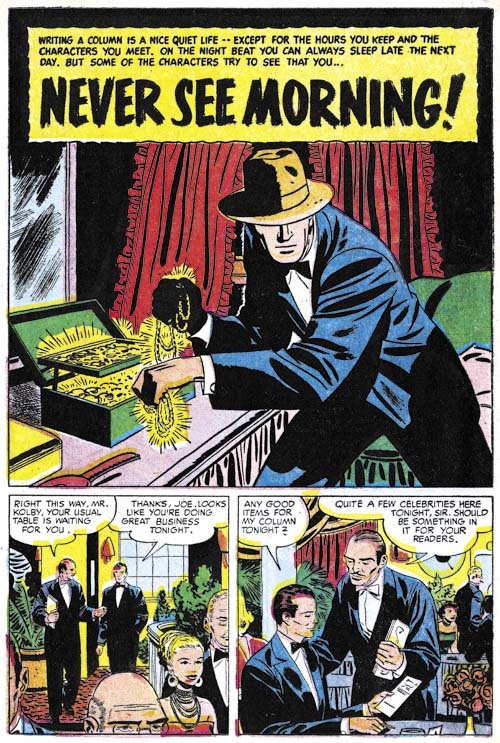 Note in particular how sinister the assailants shadowed face is in the final panel. The 50’s were important years for Alfred Hitchcock with such movies as “Strangers on a Train”, “Dial M for Murder” and “Rear Window”. I am sure Galindo was paying attention and that Hitchcock was an important influence, particularly for this story. As I mentioned earlier, most of Galindo’s crime stories do not include a splash. “G-Man Justice” is one of the rare exceptions. 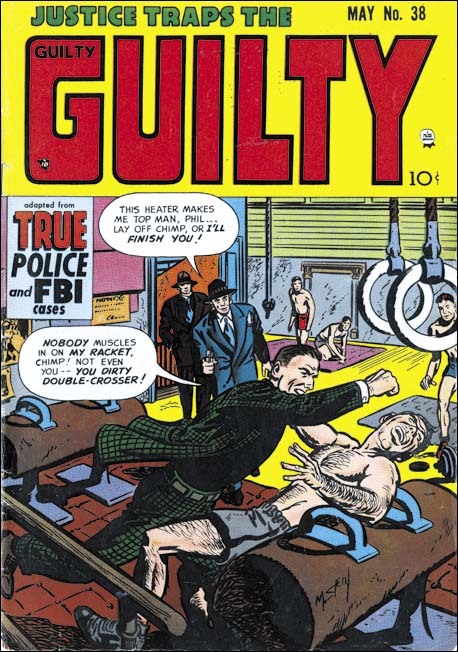 During most of the later history of Justice Traps the Guilty Marvin Stein was the primary artist and would provide the cover and the lead story. But during the end of the run Stein’s prominence was replaced by other artist. This provided Galindo with the opportunity to provide a lead story. But a lead story had to have a splash and I suspect this is why Galindo provided one for “G-Man Justice”. It is not a bad job, but in all honesty it is not that great either. 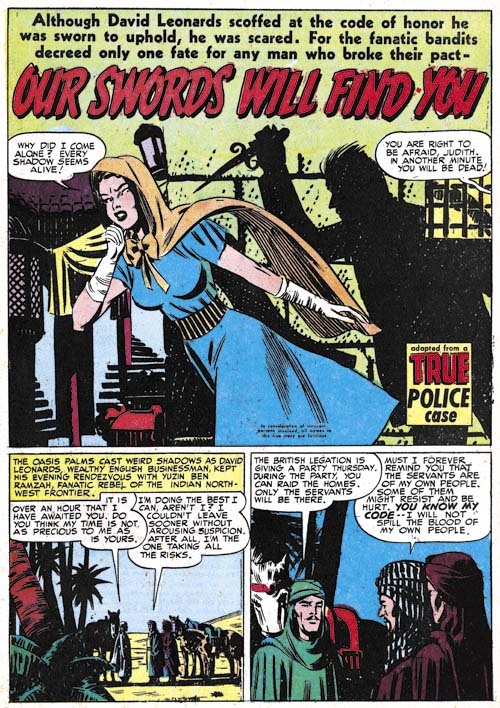 Ted Galindo did a lot of romance art first for the Prize love comics not produced by Simon and Kirby (All for Love and Personal Love) and later in all the titles edited by Joe Simon alone. I have discussed this work in the final chapters of the Art of Romance (Chapters 32, 33, 34, 35, 36, 37 and 38). Galindo’s romance work was rather nice, but it is his crime art that really shines. Ted also did work for the re-launched Black Magic. Hopefully someday I will write about that title as well. 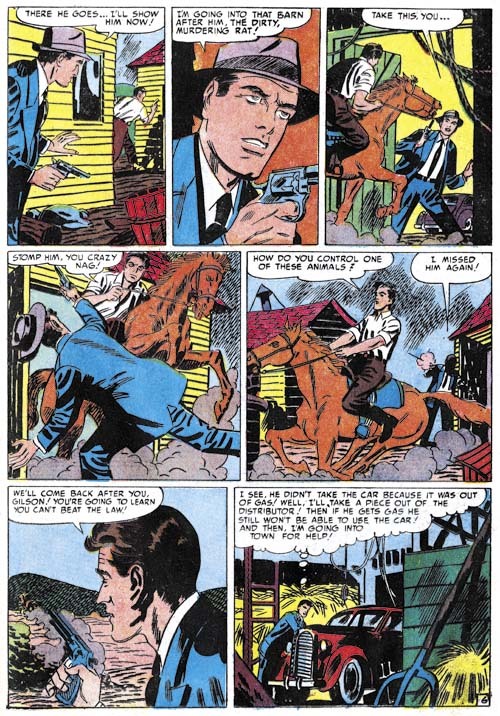 After Simon and Kirby stopped producing the Prize crime titles, Bill Draut did not contribute much as compared to artists previously discussed in this serial post, Marvin Stein and Mort Meskin. But he is an artist that I admire and it is nice to see him get a chance to work on a genre other than romance. Draut’s first return to the Prize crime titles occurring in Justice Traps the Guilty #71 (“Escape”, February 1955). I do not understand why Bill decided to do this piece. Draut seemed to be getting a fair amount of work from Joe and Jack so why do work for the Prize crime comics which I believed offered less money? But whatever the motivation, Draut did a nice job. I provide an example of an action sequence which Bill handles quite well. Still it does not read quite as well as say similar fight sequences by Marvin Stein. 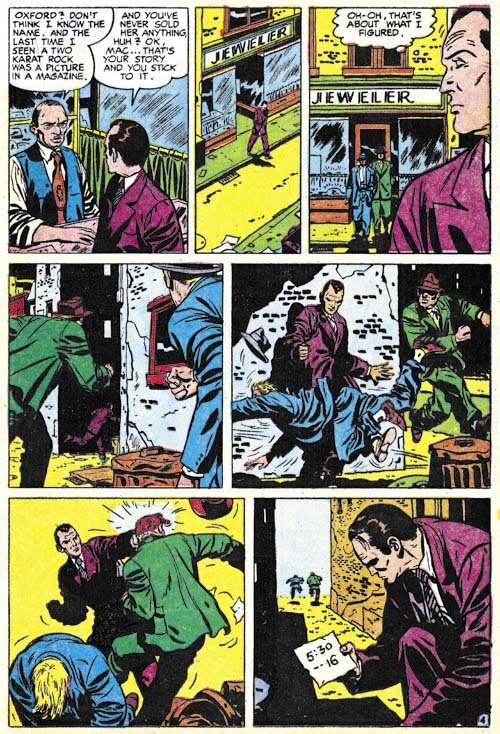 How did the hero manage to flip the attacking criminal in the last two panels? 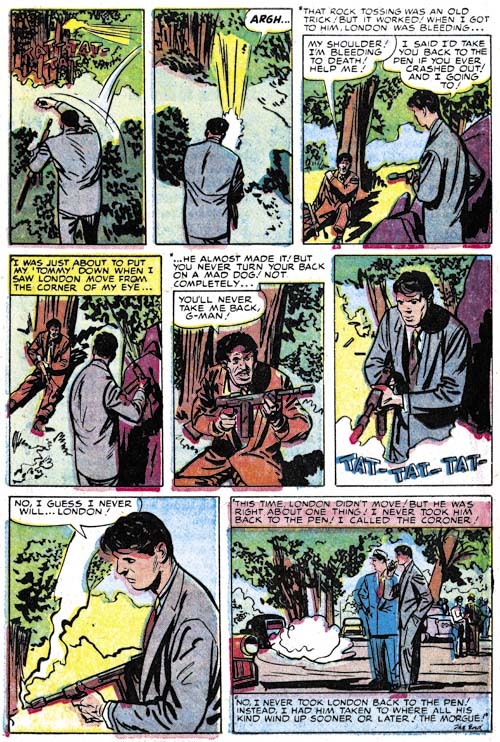 Draut did his own inking on just about everything he did, well at least up to 60’s. His inking manner in “Escape” pretty much matches what he had been using earlier. I guess the best description would be splotchy. Not really messy but with clothing dominated by rounded areas of black and with little use of narrow smooth folds. Whatever reasons Draut had for doing “Escape” it was an isolated piece. Draut would not do any other crime work for the rest of 1955 (cover date). His return to the crime titles in 1956 is easy to explain. During that year Jack Kirby began to draw pretty much all the contents of the Prize romance comics. Since those romance titles were the main source of work for Draut, this left him much in need of other sources of income. Draut would draw a peculiar series for Headline. The hero of the feature was a gossip columnist whose evening work at places like night clubs placed him in a position to fight crime as well. But that is not was peculiar about the feature, what was odd was that there never was anything in the title to indicate that this was a serial feature. You learned his name, Nick Kolby, in the story but it was only once mentioned in the title and even then not prominently. There seemed no reason not promote the feature as that was done for another returning feature in Headline at that time, Flash Cameron, a newspaper photographer who also fights crime. If Prize thought another newspaper crime fighter was too much, then why have not have Draut do some other type of crime fighter? Nick Kolby could handle himself pretty well for a gossip columnist. 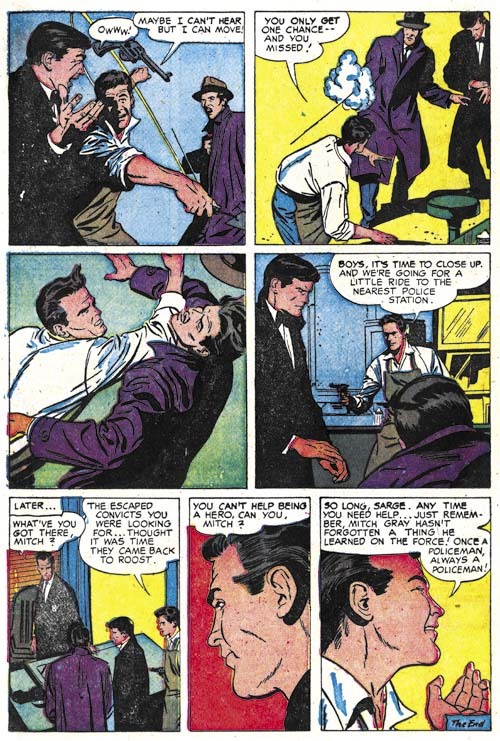 This gave Draut a chance to do some action scenes which were something that he did not often get to do for the romance art that predominated his work for Simon and Kirby. Much earlier in his career Bill did action in some features like the Red Demon and Calamity Jane and Draut has greatly improved in his ability to draw convincing and effective action. Draut inking seems to be changing having less of the splotchy effect with cleaner lines and an over all lighter look. Previously I had credited his style change as due to working for DC but I do not believe Bill had started with DC yet. However it was his inking style that was changing, not the way he did his pencils. “Hot Stuff” also provides and example of Draut handling an action sequence. He does it quite well although panel 5 takes a closer examination in order to figure out what the hero was doing (tripping his first pursuer). This is not quite the action choreography as used by Jack Kirby or even Marvin Stein, but Bill does have his own way of handling it. I used to think that Jack Kirby and Marvin Stein were the only artists who drew covers for Headline Comics. However Headline #76 (May 1956) eluded me until recently and I previously believed it was by Stein based on some low resolution scans I had seen. But when I finally got a copy I saw I had clearly been mistaken. There were Bill’s classic eyebrows and the way the bricks are clustered into isolated patches is a typical Draut technique. It is surprising that Draut instead of Stein did this cover since Marvin was the primary artist at this time. Also surprising is that Bill’s cover illustrates Flash Cameron a feature that Ted Galindo drew in this issue. Now there are any number of contingencies that we would never know about that might brought about Draut providing this cover, but I would like to suggest one possibility. Perhaps the cover was originally meant to portray Nick Kolby, a feature that Bill drew. Take away the camera and the press pass in the hat and this is a good match for Kolby. Those two features could have easily been added by Bill or another artist to convert it from Kolby to Cameron. Without the original art we will never know for sure. I could not resist on last example from Draut’s Nick Kolby feature. This was also Bill’s last appearance in Headline and Nick Kolby ended here as well. Since this feature was drawn by Draut and no other artist, it seems likely that Draut was involved in its creation. I never heard of Draut writing scripts but perhaps he teamed up with some writer. I do not want to convey the false impression that Bill Draut was only providing work for Headline during this period. Draut was doing work for Justice Traps the Guilty as well. However that work was for individual stories and not some continuing feature. 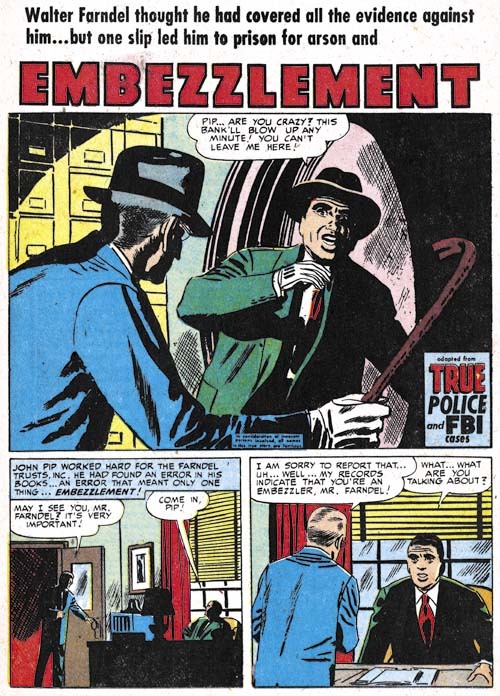 It was always my intention to finish the serial post “It’s a Crime” by covering the Prize crime titles during the period when they were no longer produced by Simon and Kirby. My reluctance to continue may have been in part due to how inappropriate it seemed to review the material as a series of sequential time periods as I had been doing previously. 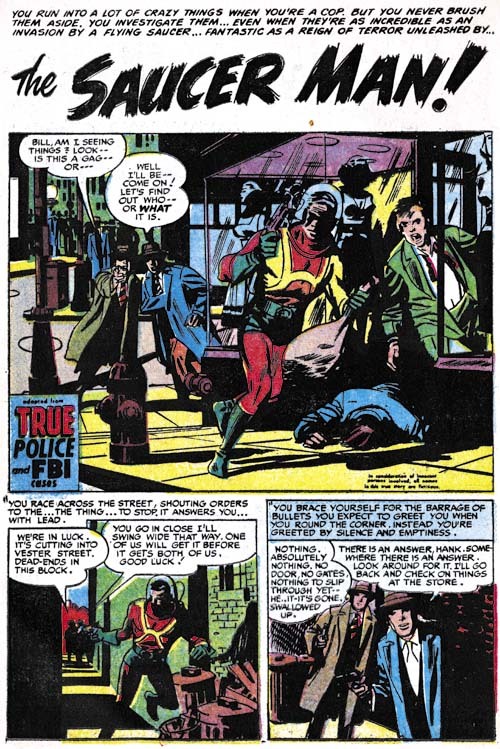 Unlike what was seen in the Simon and Kirby produced crime titles, the later issues did not change that much over most of their runs. 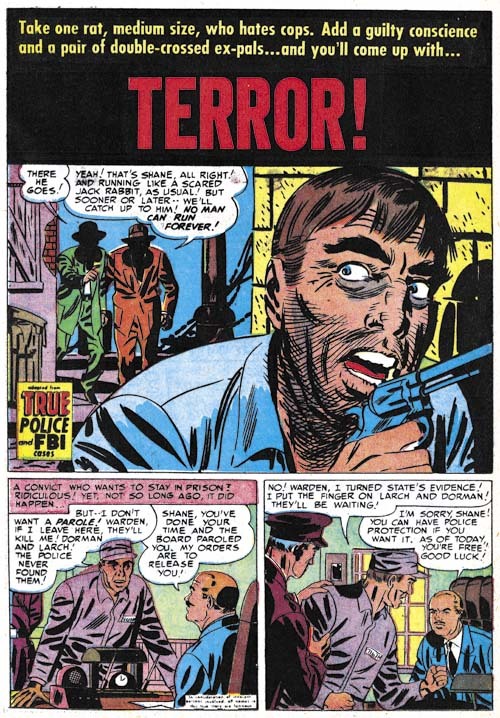 Much of the consistency of the crime comics was due to the presence of one single artist providing most of the covers and lead stories. So I have decided to end my original serial post and start a new one. 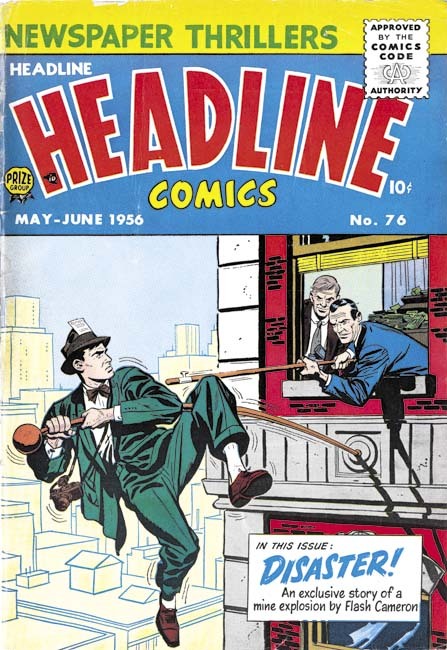 In this one I will be covering the crime titles Headline and Justice Traps the Guilty from March 1951 to April 1958 (cover dates) but by devoting a separate chapter to different artists. 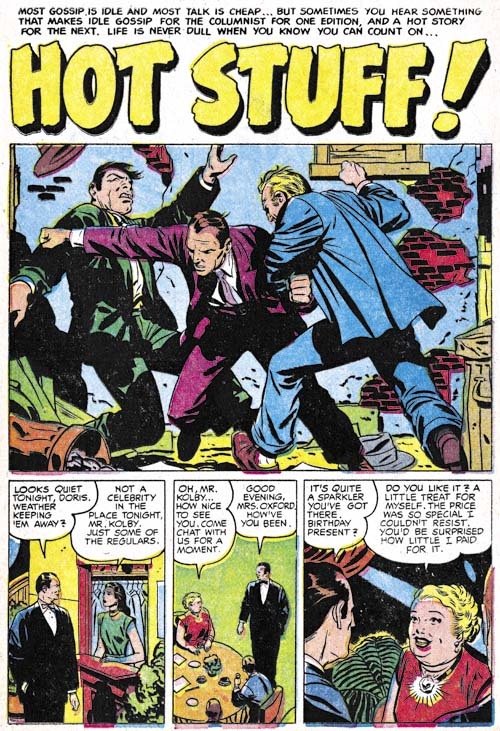 When Joe Simon and Jack Kirby started producing crime comics for Prize the stories were rather strong. Gun battles with lots of bullets and pools of blood were not uncommon. I do not believe they went as far as some publishers but still it was pretty violent stuff. At that same time there was a vocal oppositions to comics, particularly the crime ones. I am sure that it was because of this public criticism that Simon and Kirby began to tone down the violence. There were still gun shootouts but little if any blood. These less violent crime stories continued even after Simon and Kirby stopped producing the titles. I am sure this is why comic book fandom has pretty much forgotten about the later Headline and Justice Traps the Guilty comics. However I am not sure this is justified. The stories are well written and while the artists are not well known today many of them did really nice jobs. The most detracting thing I can say about them is that there are so many issues and as I said above they all looked pretty much the same. An analogy (which I am sure some readers will reject) can be found with Marvel monster stories. Good reads but I doubt anyone would read through them all without occasionally taking a break with some other genre. The first artist for this serial post had to be, just had to be, Marvin Stein. The Prize crime titles were virtually defined by his presence. Marvin did all the non-photographic covers for Headline that were not done by Jack Kirby (issues #46 to #77, March 1951 to September 1956). 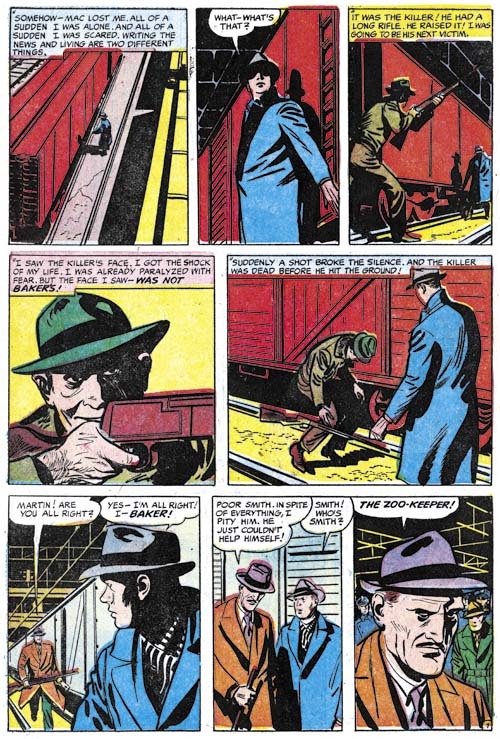 This is almost true for Justice Traps the Guilty (issues #20 and #24 to #88, November 1950 and March 1951 to August 1957). Only the covers for the last 4 issues of JTTG were done by someone else. Similarly Stein generally provided the first (lead) story. Unfortunately I am still uncertain about identifying some of Stein’s earlier work. There are a few early lead stories that may or may not be attributable to Stein. There is at least two that were definitely not done by Marvin. But before long Stein would take over the lead story and keep it. Up until the end of Headline and to issue #89 of Justice Traps the Guilty. And while some other artist did the lead story for JTTG #90 he imitated Marvin Stein! Not only was Marvin the cover and lead artist, many issues had a second story by him as well. 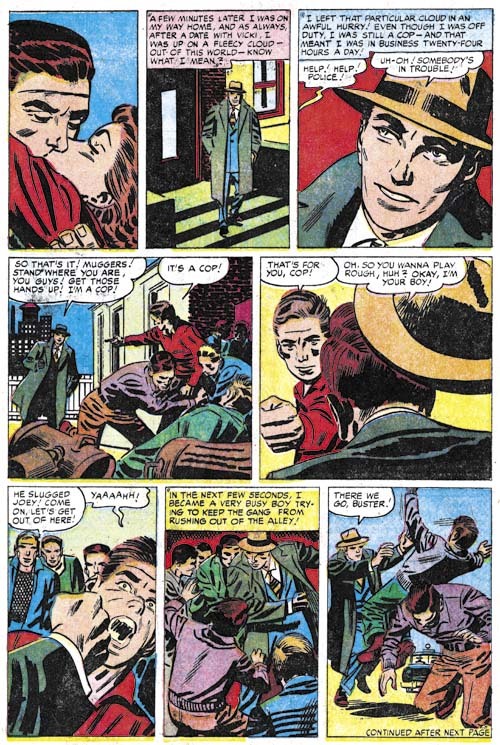 Even after he was no longer the lead artist, each JTTG would have a story done by Stein up to the very last issue (#92, April 1958). 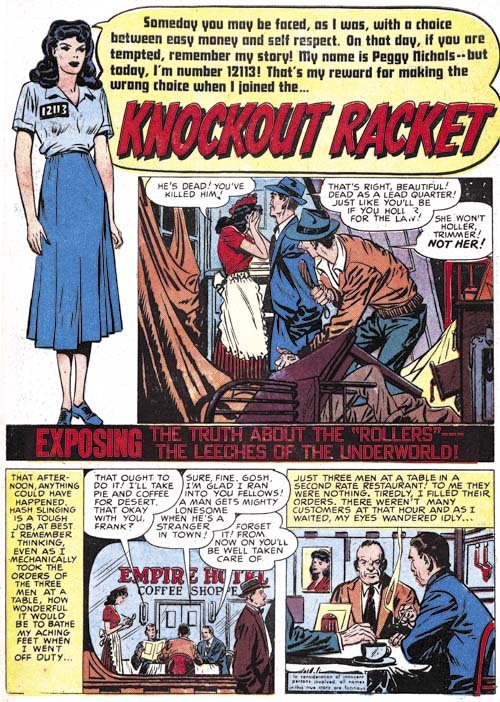 Justice Traps the Guilty #14 (February 1950) “Knockout Racket”, art by Marvin Stein? 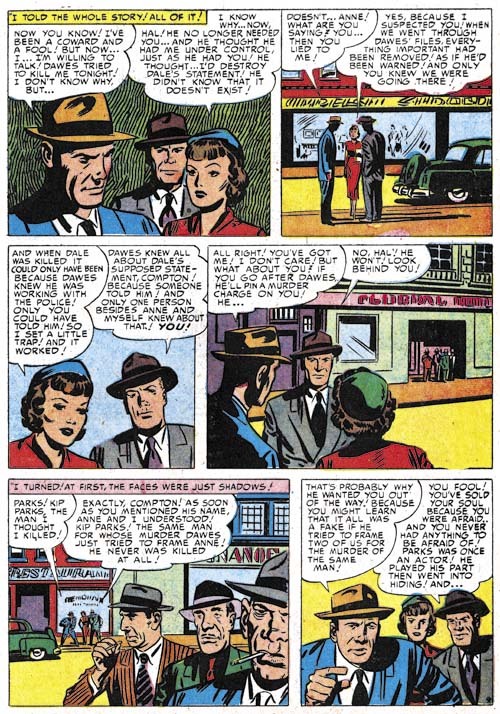 The earliest work for Prize Comics signed by Marvin Stein was in JTTG #22 (January 1951). Although unsigned, the cover for JTTG #20 (November 1950) was almost certainly done by Stein as well. There are a number of earlier pieces whose attribution to Marvin becomes progressively more difficult and uncertain. One thing is clear is that Stein did not arrive at the Simon and Kirby studio with his mature style. “Knockout Racket” is the earliest lead story that I am comfortable to even questionably assign to Stein. But it is tentative; perhaps the only thing on the page shown above that I can point to that suggests Stein’s mature style are the eyes of the lady in splash. 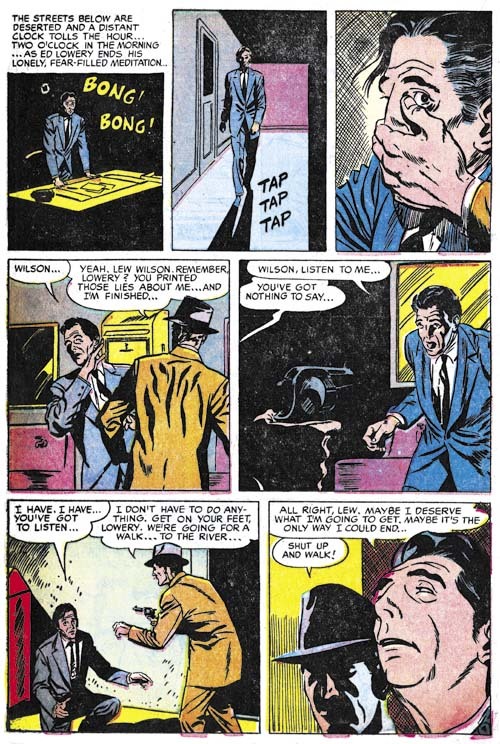 The first page shows a device often used by Simon and Kirby for their romance stories, the confessional splash. This is a format where a character in the splash introduces the story and where the speech balloon contains the title. All of Stein’s lead stories use a confessional splash while those other early lead stories by other artists did not. However I am not prepared to assign all lead stories with confessional splashes to Marvin. 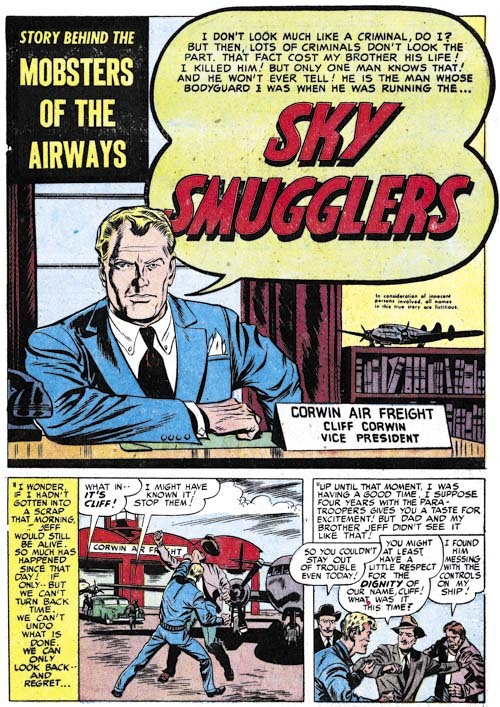 Marvin Stein was still far from his mature style when he did “Sky Smugglers”. Although unsigned, as most of his crime stories were, there are enough examples of typical Stein traits to leave no doubt that this was his work. One trait in particular to note is the shadow that trails down the right side of the face for the man in the splash. Normally comic book artists draw shadows that originate from a single light source but in this face Stein is using two light sources; a prominent one from the front a little to our right and a secondary one further back and from the left. The shadow exists in the region not fully illuminated by either of these light sources. I refer to this type of shadow as a negative highlight. Marvin would use this technique often and in the future would even move the shadow towards the center of the face. Negative highlights are something I have not noticed used by Kirby or any other artist working for the studio. However this device was also used by Wally Wood from whom I suspect Stein picked it up. Stein had arrived at his mature style by 1952 and the cover for JTTG #38 is a good example of that style. Stein was comfortable with action but handled it in his own manner. His characters would throw a punch with a rather forward motion unlike the more rotational manner Kirby would use. While he lacked Kirby’s exaggerated perspective, Stein still had good command of perspective and used it well in establishing a point of view. 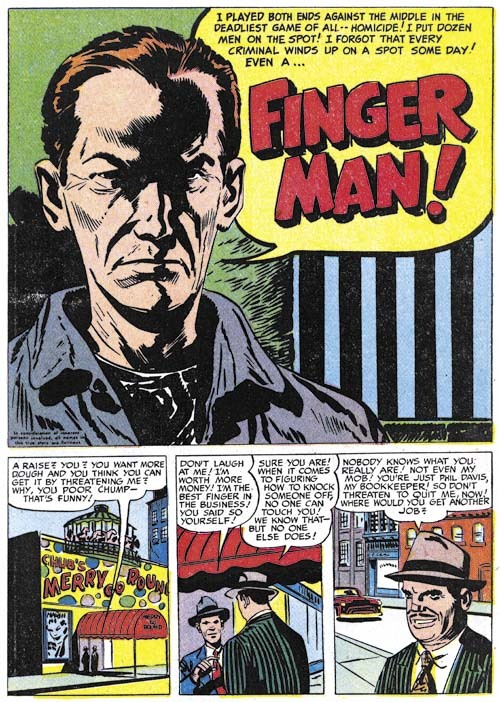 He seemed to have picked up Kirby’s penchant for flat edged fingers. Stein developed a simplified drawing for more distant faces in a manner that was distinctly his own. Marvin inked with a rather blunt brush which can easily be mistaken for crude inking but is actually rather nuanced. Note the inking on the gymnasium equipment at the bottom center; Stein would often use this sort of rice kernel pattern for inking shadows. The romance, western and crime genre that Stein most often drew generally did not provide much opportunity to depict the human body. Examples such as this boxing scene show that Marvin could do a real good job. I do not know if he was working from some reference material but it still is a very respectable piece. Stein’s depiction of men improved more rapidly than that of his women. The lady in the first panel still retains some of the artificially arched eyebrows found in Stein’s earlier work. The same lady in panel 3 seems more realistic. It is just me or does she somewhat resemble Jack Kirby’s work? I think this is most likely a case of Kirby influencing Stein. Observe how Stein’s rather blunt brush still manages his characters with individuality and expressiveness. I particular like Marvin’s work on the three thugs in panel 5. Each has his own distinct personality. Also note Stein’s manipulation of the point of view. Starting with a close-up to establish the main characters before moving to a more distance shot to place them on the street. Then another close-up is followed by what looks like yet one more but actually introduces a group of secondary characters in the background. Stein then makes a large jump in the viewpoint placing the thugs in the foreground and the main characters in the distant back. As we will see Marvin Stein very carefully controls viewpoint and pacing. I admit that I am searching for a word to use for describing a technique Stein frequently uses. For now I will use choreography for the way that Stein would sometimes arrange panels into a short time interval sequence, but I admit it is not the best term for my purpose. 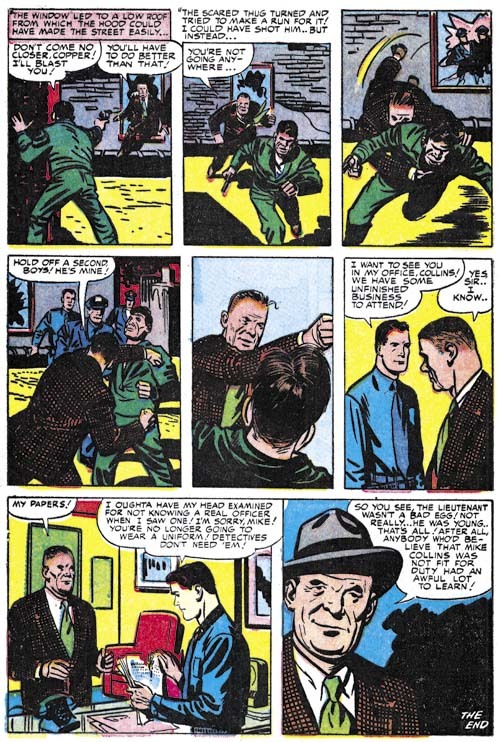 But note how in the first five panels shows the policeman’s capture of a thug. Not only does each panel only advance the time by a small amount but look how Marvin brings the action closer and closer to the reader. 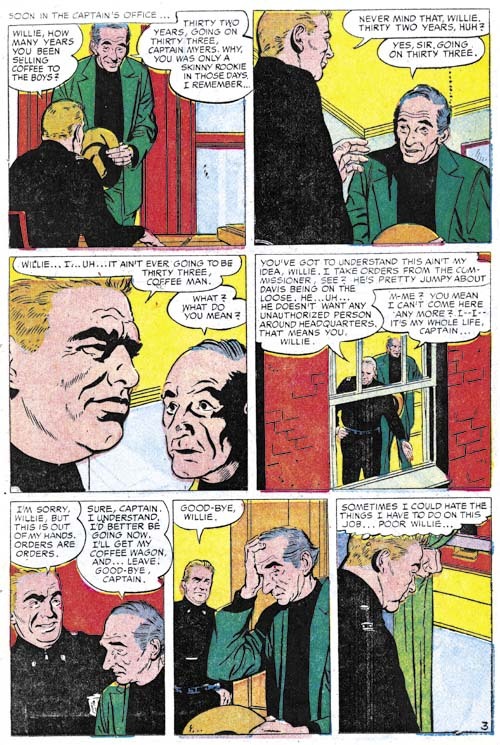 I have mentioned Stein’s blunt brush but look how masterfully he has captured the older cop in the last panel! Another choreographed sequence occupies the entire page although perhaps not as successful as the previous example. This might have been at least in part due to the Comic Code’s restriction on the depiction of violence. The more distant viewpoints may have satisfied the Comic Code but the also lessened the impact. Here is another choreographed sequence that is still successful despite the Comic Code. By keeping the thug outside of the viewpoint we do not actually see the results of the cop’s use of his machine gun but there can be little doubt about it’s effectiveness. A final example of a choreographed sequence by Stein. But again ruined by the Comic Code. 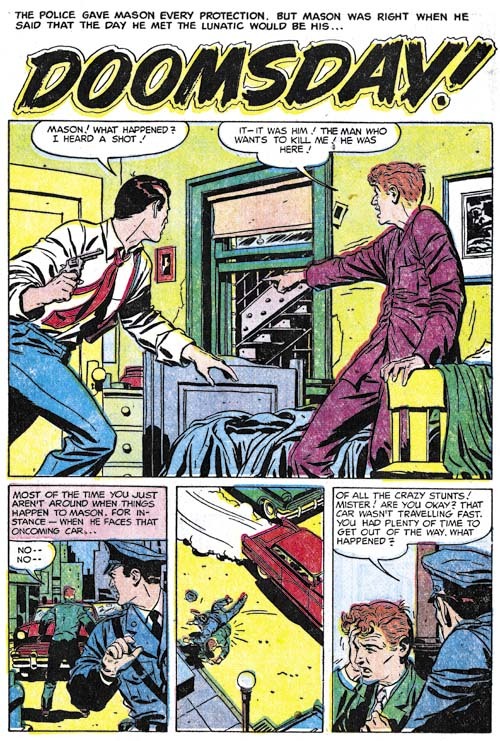 Any child could see gun fights by gangsters or cowboys on the television and in the movies but for some reason the Comic Code had to protect them from seeing someone being struck by a bullet. Without the accompanying text the reader would be left perplexed by the killer’s sudden collapse. Despite the Comic Code this is still a great page. Further it is a good example of the way Stein often used blacks to enhance the story. 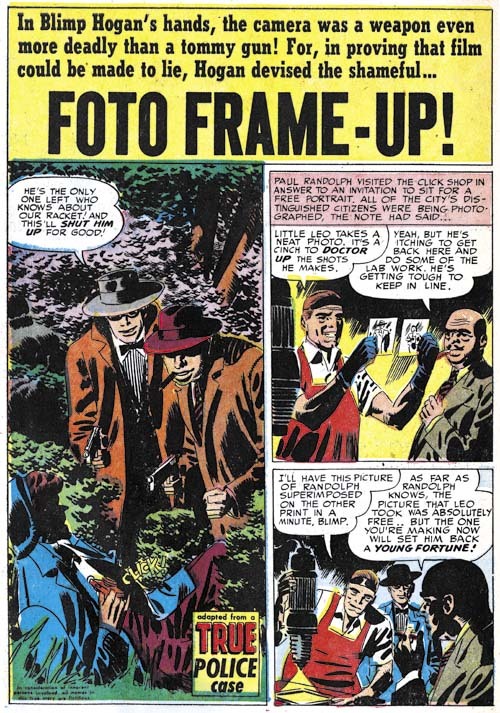 While not realistic in the technical sense of the word, the eye isolated in the killer’s shadowed half of the face seems appropriate as he takes aim (panel 4). Even the industrial ceiling adds interest to the images. Some of Stein’s more simpler splashes are actually very strong. Here we have nothing more than a talking head and a simple background. But the person’s clothing and the bars on the window indicate we are being addressed to by a prisoner. Once again Marvin is using a rather blunt brush but notice how masterly he handles the nuances that make this portrait so successful. Here also is an example of Stein’s use of a negative shadow. In fact much of the interest of this head shot is generated by this deceptively simple device. The colorist makes it even better by giving the farther portions of the face a purple color showing one of the two light sources as being more powerful than the other. Typically Marvin makes the depth of the head too shallow but far from detracting from the image this makes it all the more expressive. 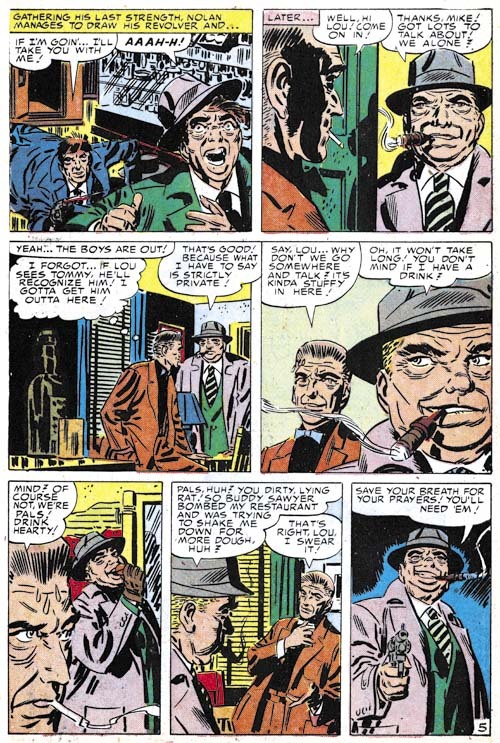 The lack of a good distinction between the eyebrow and the associated shadows is another of Stein’s mannerisms one that sometimes even appears when he inks Jack Kirby’s pencils. Here Marvin Stein provides an even more stripped down version of a prisoner in a confessional splash. The image may be simpler but with nothing lost in it’s impact. 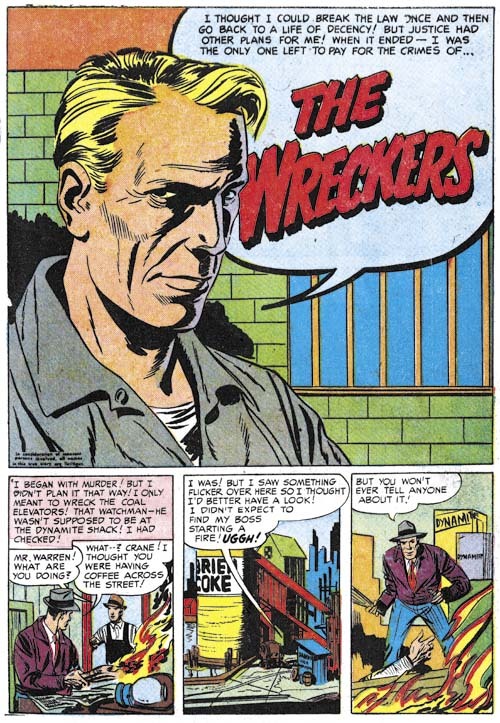 In fact I believe this is perhaps the best portrayal of a criminal by a comic book artists I have ever seen. The reader has no doubt that he is being addressed to by a hardened individual. An important contributor to the effect of this image is the strong negative highlights. No longer delegated to one side, here the shadow traces a path down the center of the face. Before closing I should mention the influence of Jack Kirby on Marvin Stein. I am not that familiar with Stein’s earlier career but he seemed to have had 5 to 7 years experience when he arrived at the Simon and Kirby studio. Marvin was one of the few artists that actually worked in the studio (at least for a period) and the presence there of comic book greats Jack Kirby and Mort Meskin had to have made an impression on him. His artwork certainly seemed to blossom over a relatively short time. Kirby seemed to have the greatest influence on Stein. It does not seem an accident that Stein’s use of point of view, carefully sequenced panels, and action became so important to his art. These same qualities can be found in Kirby’s own work. However Stein is not a Kirby imitator; he developed his own drawing style and methods for graphically telling stories. Still from time to time some have claimed that Kirby provided layouts for some of Stein’s work. I even succumbed to that error (It’s a Crime, The Master and His Protégé). 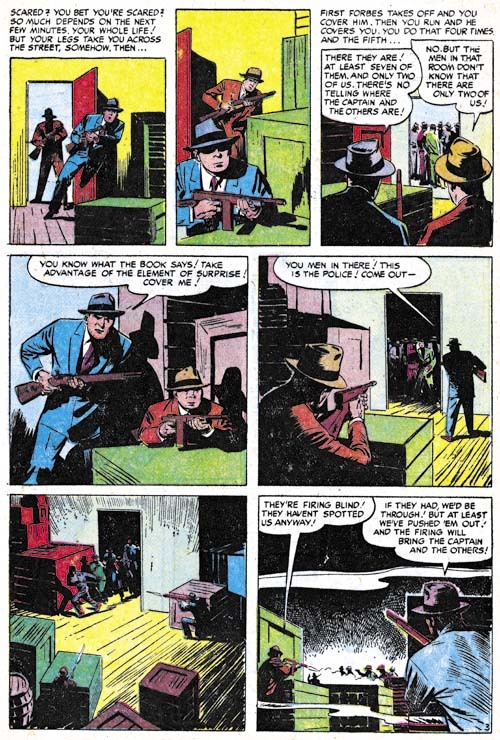 The problem with this claim of Kirby layouts is that Stein’s work consistently shows the same characteristics throughout his career. If Kirby was helping this would have to have been for everything Stein did including work done after the Simon and Kirby studio had broken up. 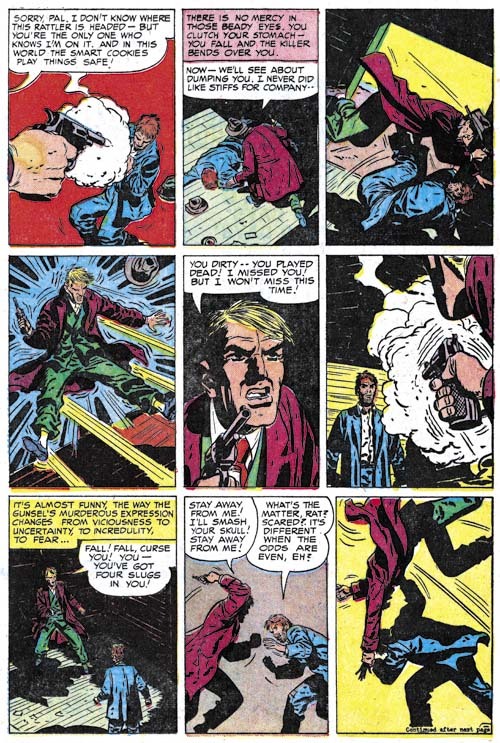 In addition Stein’s art included elements for handling action was generally quite distinctive from Kirby’s. I think we can safely dismiss all claims of significant Kirby help except for his roll as a mentor. Marvin Stein is one of those forgotten comic book artists. When remembered at all it is for his being one of Jack Kirby’s inkers. Partly this is because Marvin Stein’s work was largely for two titles for Prize, a small publisher (Headline and Justice Traps the Guilty). But Stein did work on other Prize titles and for other publishers as well including Atlas. I think another reasons for his neglect among comic fans was the distortions his figures often exhibit. From certain views his heads seem too shallow. When using a high viewpoint his heads have a distortion that is hard to describe but so typical of Stein. These distortions were not so visible in Marvin’s earlier work and seemed to become more pronounced over the years. But I do not considered academic accuracy a requirement for comic book art, quite the contrary. I have come to appreciate Stein’s distortions and the expressionistic quality they gave to his art. I will say that while Marvin’s drawing style worked well with the crime and western genre it seemed a poor match for romance stories. The final factor in the decline of Stein’s reputation was his inking. Stein’s inking looks deceptively simple. It certainly does not offer much for those that are fans of detailed and intricate art work. However I hope that some of the examples I have provided in this post will show that his brushwork was capable of great subtleties. While some have claimed Stein’s work looks rushed I think a more accurate description would be economical. Stein carefully provided the essentials for the story and left out that which he considered extraneous. It is an approach that I admire.